As my Father in law loves growing his own vegetables in his garden, I decided that for his Birthday I would make him a surprise inside carrot cake. 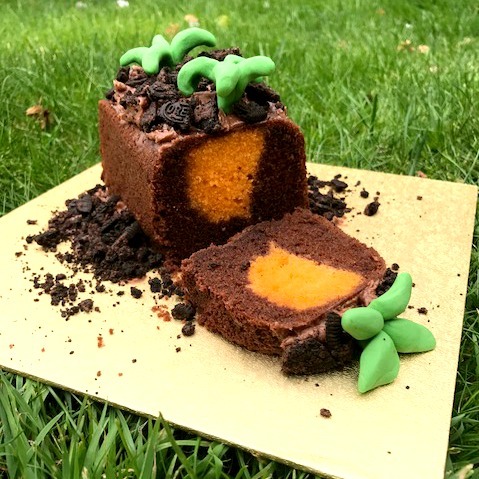 In that when you cut into the cake it looks like a carrot growing in the ground not that it is a cake made out of carrots. You could probably make the carrot part out of carrot cake but as this type of surprise inside cake is quite fiddle I wasn't going to risk it! Essentially this cake is the same technique as my surprise inside heart cupcakes, but on a larger scale. It requires baking two cakes and is more complicated than making a surprise inside checkerboard cake. Mix all of the orange cake ingredients together and place in a small lined loaf tin. Cook at 180C until a skewer comes out clean. Allow to cool. Carve out a triangle shape and then wrap in film and pop in the freezer. Mix all the chocolate cake ingredients together. Place the top of the frozen triangle of orange cake at the bottom of a small lined loaf tin. Pour the chocolate cake mixture around this. Cook at 180C until a skewer comes out clean. Make some leaves for the carrots out of green icing and allow to harden. Once the chocolate cake is cool, place the top of the cake on a cake board. You may need to flatten the top but cutting some cake off. Make up some chocolate butter icing by mixing the butter, icing sugar, cocoa powder and drop of water together. Spread this on your cake. Add the icing leaves and then sprinkle crushed Oreo biscuits on top. Add remaining butter icing and Oreo biscuits to the sides on the cake board. Then when you cut a slice of cake you will find your "carrot" inside.